(Nanowerk News) Conduction and thermal radiation are two ways in which heat is transferred from one object to another: Conduction is the process by which heat flows between objects in physical contact, such as a pot of tea on a hot stove, while thermal radiation describes heat flow across large distances, such as heat emitted by the sun. These two fundamental heat-transfer processes explain how energy moves across microscopic and macroscopic distances. But it’s been difficult for researchers to ascertain how heat flows across intermediate gaps. Phonons represent units of energy produced by vibrating atoms in a crystal lattice. For example, a single crystal of table salt contains atoms of sodium and chloride, arranged in a lattice pattern. 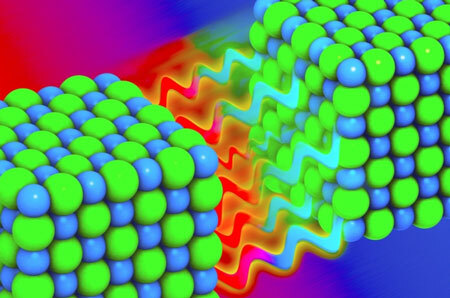 Together, the atoms vibrate, creating mechanical waves that can transport heat across the lattice. Normally these waves, or phonons, are only able to carry heat within, and not between, materials. However, the new research shows that phonons can reach across a gap as small as a nanometer, “tunneling” from one material to another to enhance heat transport. The researchers believe that phonon tunneling explains the physical mechanics of energy transport at this scale, which cannot be clearly attributed to either conduction or radiation. Chiloyan and Gang Chen, the Carl Richard Soderberg Professor of Power Engineering and head of MIT’s Department of Mechanical Engineering, publish their results this week in Nature Communications. In the past few decades, researchers have attempted to define heat transport across ever-smaller distances. Several groups, including Chen’s, have experimentally measured heat flow by thermal radiation across gaps as small as tens of nanometers. However, as experiments move to even smaller spacing, researchers have questioned the validity of current theories: Existing models have largely been based on theories for thermal radiation that Chiloyan says “smeared out the atomic detail,” oversimplifying the flow of heat from atom to atom. In contrast, there exists a theory for heat conduction — known as Green’s functions — that describes heat flow at the atomic level for materials in contact. The theory allows researchers to calculate the frequency of vibrations that can travel across the interface between two materials. Typically, electromagnetic forces can be described by Maxwell’s equations — a set of four fundamental equations that outline the behavior of electricity and magnetism. To explain heat transfer at the microscopic scale, however, Chiloyan and Chen had to dig up the lesser-known form known as microscopic Maxwell’s equations. “Most people probably don’t know there exists a microscopic Maxwell’s equation, and we had to go to that level to bridge the atomic picture,” Chen says. The team developed a model of heat transport, based on both Green’s functions and microscopic Maxwell’s equations. The researchers used the model to predict heat flow between two lattices of sodium chloride, or table salt, separated by a nanometer-wide gap. With the model, Chiloyan and Chen were able to calculate and sum up the electromagnetic fields emitted by individual atoms, based on their positions and forces within each lattice. While atomic vibrations, or phonons, typically cannot transport heat across distances larger than a few atoms, the team found that the atoms’ summed electromagnetic force can create a “bridge” for phonons to cross. When they modeled heat flow between two sodium chloride lattices, the researchers found that heat flowed from one lattice to the other via phonon tunneling, at gaps of one nanometer and smaller.